Gray To Become A Gooner? We have seen plenty of nonleague hotshots make the step into the Football League, and even the Premier League, in recent years. Jermaine Beckford, Jamie Vardy, Kwesi Appiah, Joe Lolley and Dwight Gayle are just a few of the semi-professional stars to go full time as they chase their footballing dreams. However, according to Football Direct News, Luton Town hitman Andre Gray could be the next, as Premier League big guns Arsenal are apparently weighing up a move for the 22 goal Conference Premier leading scorer. England C international Gray, 22, has been a revelation at Kenilworth Road since joining from Hinckley United – and he wasn’t too bad there either! After hitting 39 goals in 90 appearances for Hinckley, Luton paid just £30,000 to secure his services, and it looks like money well spent. 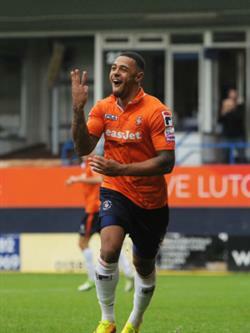 The striker has had a similar scoring record in nonleague’s top flight, hitting 49 in 96 appearances for The Hatters. Gray’s contract expires in summer 2015, so if Luton are to make any profit, they will need to sell him this summer unless they can persuade him to sign a new deal. Unlikely if the rumoured Arsenal interest in him proves to be for real. Now, it goes without saying that this would be a huge move for Gray, and a huge step up in terms of quality. It’s unlikely that he would be anywhere near the first team squad, instead he would probably be loaned to League One or Championship clubs during his first year or two as an Arsenal man. And even that would be a massive leap compared to the Conference. But these opportunities don’t come around often, and you have to back yourself and take that leap if you want to be successful. Posted on February 17, 2014, in UTL Archive and tagged Andre Gray, Arsenal, Conference Premier, Luton Town. Bookmark the permalink. Leave a comment.